Blue will be the new white | What Car? 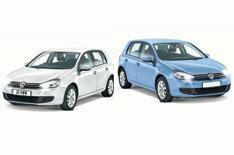 Blue is being tipped as the next 'in' colour for cars, says Volkswagen. White cars have been vogue for a number of years - for example, at the Geneva motor show in March there were 200 white cars on the show stands, while there were 80 blue cars at the same show. However, VW Group head of marketing Luca di Meo says that white will have another couple of years as the colour to have for auto fashionistas. The group is looking at various shades of blue to eventually take over. 'Why not - it is the Volkswagen colour?' he said. This contrasts with what car buyers actually choose. The most popular colour for new cars last year was black - 24% of customers opted for this colour, while blue was the fourth most popular (with 16.2%) and white was 10th most popular, with 10% of the market.